While taking a stroll in Dubai’s most historic neighbourhood—Al Fahidi, we stumbled upon this authentic Emirati Restocafe - Arabian Tea House. A quick lookup of the place online and we instantly knew that there wasn’t a better way to spend our afternoon than by sipping on some traditional tea under the shade of a grand old tree, with white wicker chairs, rustic turquoise benches, and lace curtains spread across an old beautiful courtyard. With an ambience and charm of old Dubai, this place seemed to be a favourite for both localites and tourists. We were lucky to have found a table on a busy weekday afternoon, so I would suggest you make a table reservation before visiting the cafe. 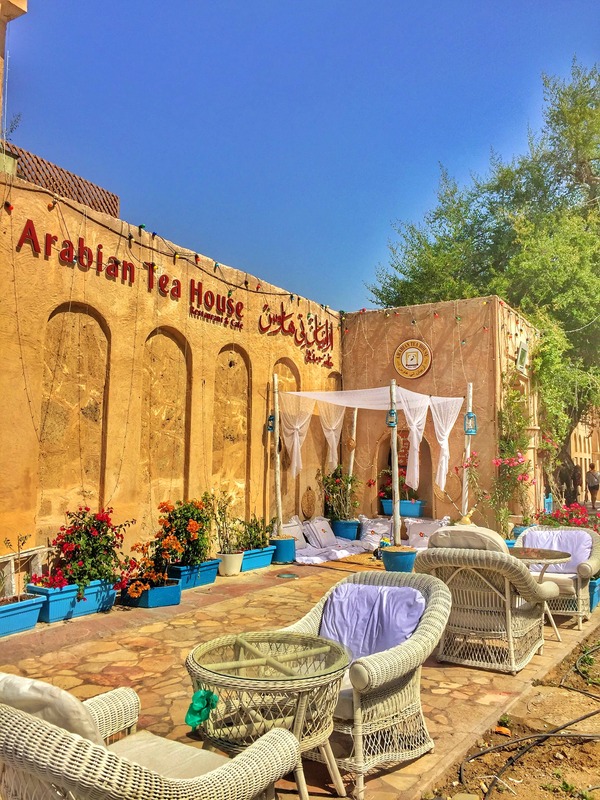 We really understood why people were raving about this place after tasting some traditional teas and a variety of delicious Emirati, Arabian, and Middle Eastern food that sure tingled our taste buds. Serving authentic Emirati Cuisine with a traditional look and feel, Arabian Tea House is a must visit if you’re looking to relish some local food and experience the culture.